A Joomla template all about fun fun fun! 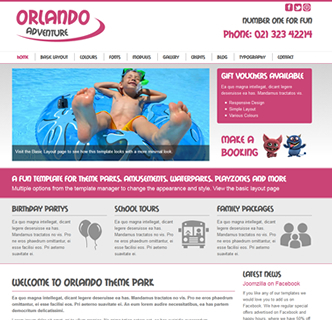 This adaptable and responsive template works great for adventure parks, activity centers, playzone's, children's fun parks, zoo's, circus and more. With all the easy to use customisation features of this template you can build your perfect fun filled website that looks great on desktops, tablets or mobile phones. While testing out the demo website be sure to play around with the different colour options and view the different fonts. The basic layout offers a more minimal design without compromising on quality or professionalism. Use the quickstart demo on this template to get a complete replica which you can modify to suit your needs. This joomla template also comes with an excellent image gallery. Adding photographs to the gallery only requires images to be uploaded to your specified folder. The only other extension required is DJ image slider and this is also included with the package. Visit the demo website for this template on your mobile phone or try resizing your browser to see how perfectly it adapts to all devices.